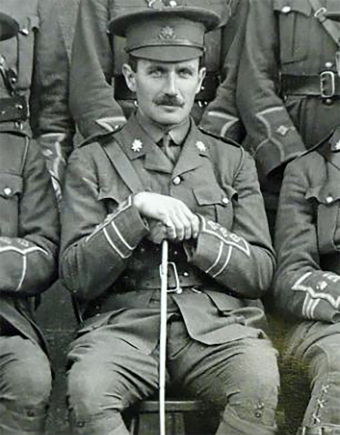 Captain Robert Campbell began his British Army career in 1903 at the age of 18. Shortly after WWI started, in July of 1914 Campbell and the soldiers he was leading, the First Battalion East Surrey Regiment, were sent to Mons-Condé canal in the north west of France. 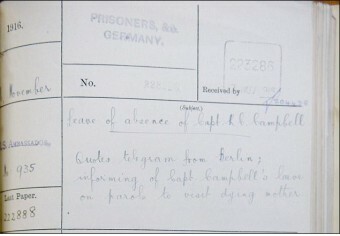 One week later, after an attack by German forces, Captain Campbell was seriously injured and ultimately captured. He was then treated in a German military hospital in Cologne, and, once healed up a bit, sent to the prisoner-of-war (POW) camp in Magdeburg, Germany. None of this makes Captain Campbell particularly unique in the “War to End All Wars.” Between 1914 and 1918, approximately 10 million civilians and servicemen were captured and interred at various detention camps. What makes Campbell’s story different is something that happened two years after his capture. Now in his early 30s, Captain Campbell received word that his mother, Louise, was suffering from terminal cancer. 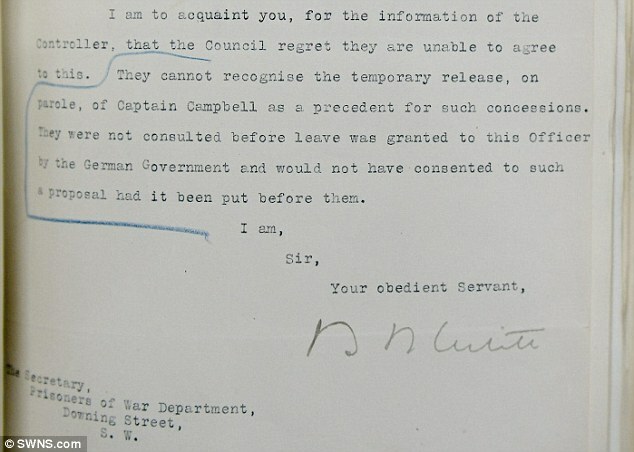 With nothing to lose, Campbell wrote directly to Kaiser Wilhelm II, requesting compassionate leave so that he might see her before she passed. After giving his word, Captain Campbell was indeed released. Details of how he actually made it home have been lost to history, but it is thought that he traveled through the Netherlands and then took a boat to Kent. Upon arriving home, he spent a week with his mother before returning to the POW camp by equally mysterious means. There was no recorded explanation in the British military archives why no one in the army tried to block his return, but presumably a British officer’s honor being at stake had something to do with it. 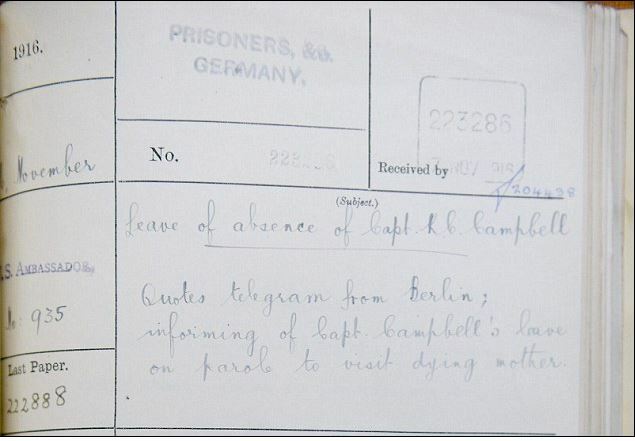 Whatever the case, in February of 1917, Captain Campbell’s mother died while he was still a prisoner. Perhaps to keep himself occupied, and said to be a matter of honor and duty, as soon as Captain Campbell returned to the prison camp, he and a group of other prisoners spent the next nine months digging a tunnel out of their camp. This tunnel project was partially successful in that they were able to use it to escape the camp, but were caught near the border of the Netherlands and sent back. At the war’s end, along with the other POWs, Captain Campbell was released and remained in the Army until he retired in 1925. When WWII began, Campbell rejoined the army and served as the Chief Observer of the Royal Observer Corps on the Isle of Wight. He lived to the ripe old age of 81. ultimately dying in 1966. Typhus was a serious problem in many POW camps, and in one, Mauthausen, an average of 186 POWs died each day of this in January of 1915. In another camp in Russia (Totskoe), out of the 25,000 prisoners held there during the winter of 1915-16, 10,000 died from various diseases. Different nationalities had vastly different death rates in POW camps, with German soldiers held by Britain with the lowest at 3%, and Romanian prisoners held by Germany with the highest at 29%. Forced labor was common for POWs, and while the Germans sent British and French prisoners to work on both fronts, the British also sent German prisoners to work on theirs, as well as in North Africa. In addition, POWs were used in smaller groups as general laborers, fulfilling the jobs that used to be done by soldiers, such as in agriculture, mining, forestry and construction. Sixty-five million (65,000,000) troops fought in WWI, with Russia sending the most at 12,000,000 and Montenegro the least of those that participated with about 50,000. Eleven million Germans, nearly 9 million British, 8.5 million French, nearly 8 million Austro-Hungarians and 5.6 million Italian soldiers fought, as did 4.4 million Americans. As a direct result of WWI, the power of the British empire began to decline, the Ottoman and Austro-Hungarian Empires broke up, the countries of the Middle East were realigned, Poland was reconstituted, the Baltic republics were established, and the Bolsheviks overthrew the Czar in Russia. Sorry, but not unusual: Campbell’s story is well documented. Campbell was granted his parole, in part because he was a distant kinsman of the Hohenzollern family: a fifth cousin. That and in 1916 paroles were granted officers on both sides fairly regularly. By the time the German private asked for leave, 1917, the war had changed character completely, and no one, regardless of rank or status, was being paroled.